What? No bright orange Halloween bake? I could pretend that I deliberately avoided creating anything tacky on purpose… but the truth is that unfortunately my hidden pumpkin cake did not go to plan at all. It was a mess. Less hidden pumpkin, more hidden blob. It tasted good though – so I’m sure there is a fantastic chocolate loaf cake recipe to be salvaged from the wreckage further down the line. But for now, let’s stay classy with some pumpkin spice instead. This was my second foray into the pumpkin world, after some orange pumpkin spiced donuts that Katie ‘grew to love’. I haven’t posted them yet due to not being in love with my photos from that day. I don’t really know if they will ever see the light of day. Or maybe next fall I will bring the recipe back out and give it a second shot. Hopefully after another year of taking photos of food, I will have improved enough to make them look as delicious as they tasted. Anyway – you’re here for cookies, not my life story. Of course I’m going to tell you how easy these are to make. I write that every time I sit down to do one of these posts. I’m sure you’ve realised by now that I don’t post things that you wouldn’t be able to make yourself. It’s just not how I roll. 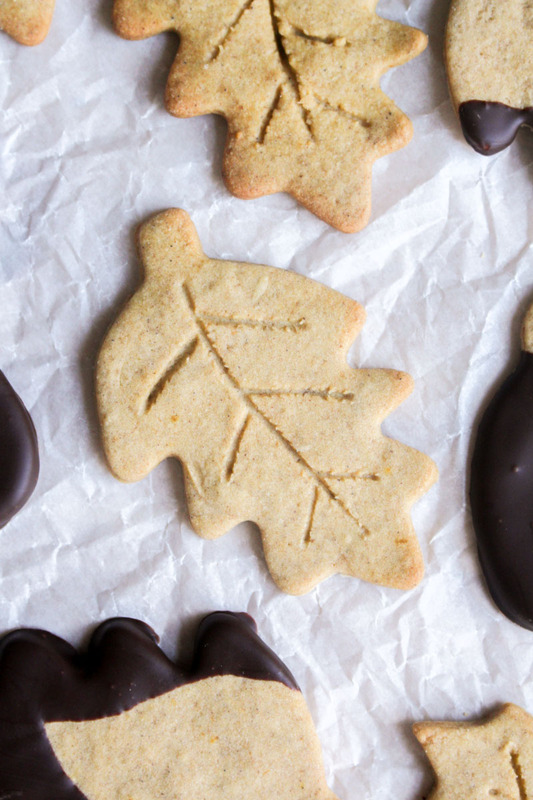 So yes – easy to make autumnal cookies are here. You will need some time though, as of course there is some chilling involved. This is necessary to make sure that the cut-out cookies don’t spread and lose their shape. You are going to love how sturdy this dough is – you can draw little leaf lines on them with a toothpick and they will still be there when they come out of the oven. And decoration just doesn’t get easier than that. Of course, you can dip them in chocolate if you like too. I went for some 70% dark, but if you want to use milk then go for it. Maybe even white? I’m in an experimental sort of mood, so go for it. Let me know how it works out. I used these adorable cookie cutters for my pumpkin spiced cookies, which I hope you’ll agree makes them the most adorable biscuits you’ll set your eyes on this fall. 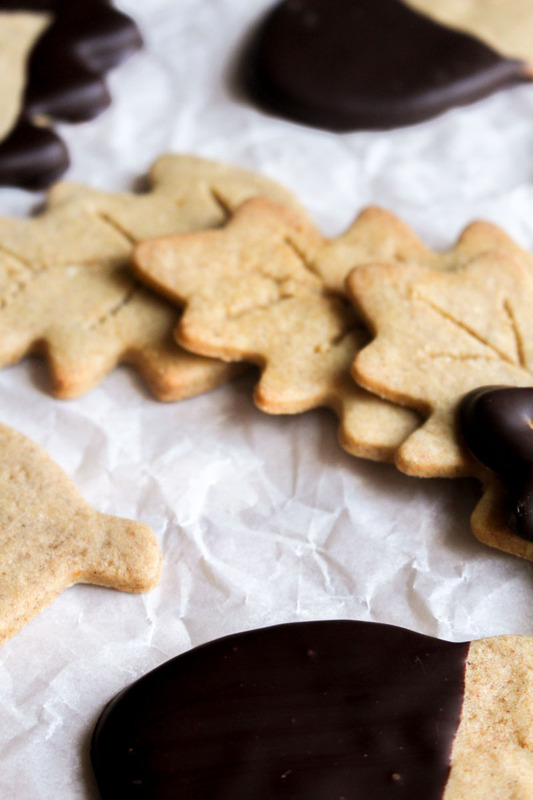 If you don’t want to splash out on new cutters though, these cookies will taste just as good cut out with any cutter you’ve got lying around. Or go all artistic and cut out shapes free-hand with a knife. The recipe below uses canned pumpkin, but not anywhere near a full can. So these are the perfect cookies to whip up if you’ve just made a pumpkin pie, and have a little bit of pumpkin left over that you don’t know what on earth to do with. Not that I’ve ever made a pumpkin pie in my life. Maybe next year? 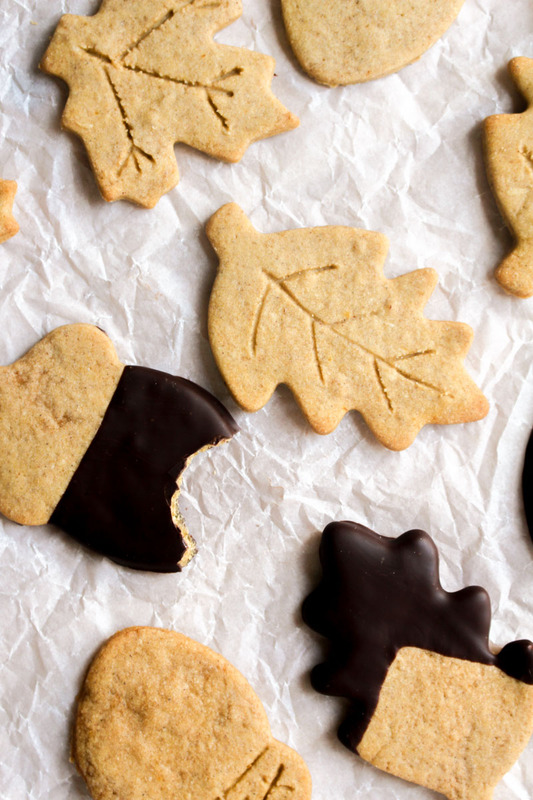 The perfect autumn cookie, filled with all the flavours you would expect from pumpkin spice. Plus - dough that will not spread in the oven! Preheat the oven to 180°C / 350°F (160°C fan) and line a couple of baking sheets with baking parchment or grease proof paper. Cream the butter, caster sugar, and brown sugar together in a large bowl or the bowl of your stand mixer, until light and fluffy. Add in the egg, vanilla, and pumpkin purée and mix until fully incorporated. Add he flour, cinnamon, ginger, nutmeg, all-spice, and salt, and gently fold together until a dough forms. Wrap the dough in cling-film or plastic wrap and pop in the fridge to chill for an hour. Once the dough has chilled, roll out with a rolling pin on a lightly floured surface, until the dough is about a ¼ inch thick. 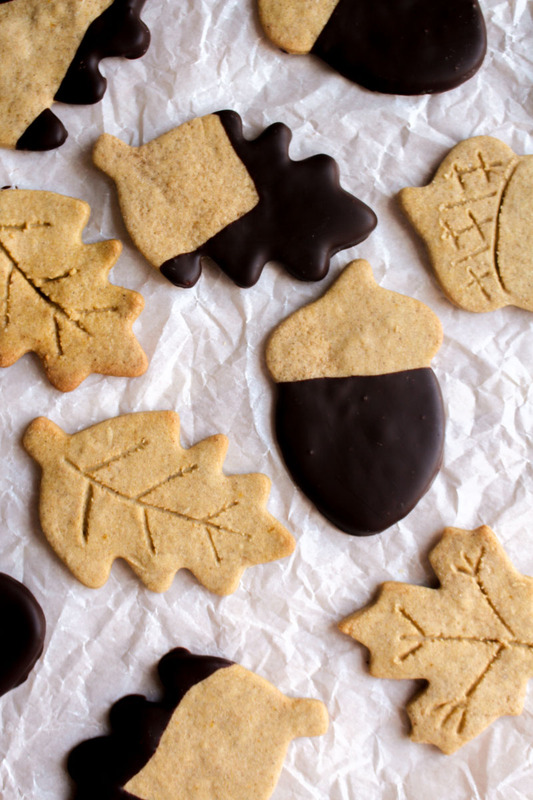 Cut out shapes with the cookie cutters of your choice, or freehand with a knife. If you like, you can also score patterns into the cookies using a toothpick or skewer. Place on the lined cookie sheets and bake for 10-12 minutes. The cookies will still feel a little soft after this time, but leave to cool on the baking sheets for 5 minutes and they will harden up. Gently place the cookies on a wire rack to finish cooling. Once completely cool, you can either leave as they are, or dip them in some melted dark or milk chocolate. The cookies will stay fresh for 3-5 days if stored in an airtight container. The dough can be frozen before being baked - just leave to thaw at room temperature or in the fridge overnight. The baked cookies can also be frozen - leave to defrost at room temperature and then store in an airtight container.